The Best Cherry Jello is exactly what the name states. 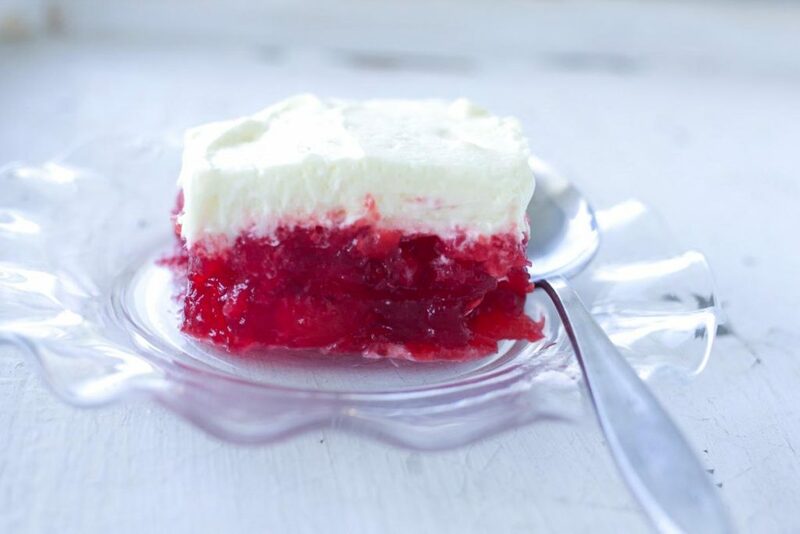 Claudean’s Cherry Jello is legendary in our home. I really only make one Jello recipe, and this is IT! I know you’re thinking, really, JELLO? In our part of the country, Jello is a staple at most family dinners, church gatherings, funerals, parties, etc. I’m not a big fan, but you can’t hardly call yourself a good Mormon woman without having at least one good Jello recipe under your belt. This recipe for The Best Cherry Jello is my go-to Jello. Have you ever heard of a person living in Utah who can’t make at least 5 different tried and true Jello dishes without looking at a recipe? Call me to repentance. I don’t know why, but I’ve never had good luck with Jello. It’s always too runny, or not mixed up enough, with that rubbery layer on the bottom of the pan. Or the outside sets up, but not the middle. I was a failure in the J-E-L-L-O dept. I had all but written off Jello, and my ability to be a perfect Mormon homemaker, and then a few years back, I found this recipe in a local school cookbook. Claudean is an expert at making anything sweet. She shared her recipe with the school when they were compiling a cookbook years ago. It’s really a dessert of sorts, disguised as a Jello “salad”. So it’s totally legal to serve with dinner. It sets up more quickly than just a plain pan of Jello because of the pie filling and crushed pineapple stirred into the Jello, and is topped with a mixture of pudding and whipped cream all folded together. Sets up in two hours. Jello Perfection, my friends. This is it. Boil the water. 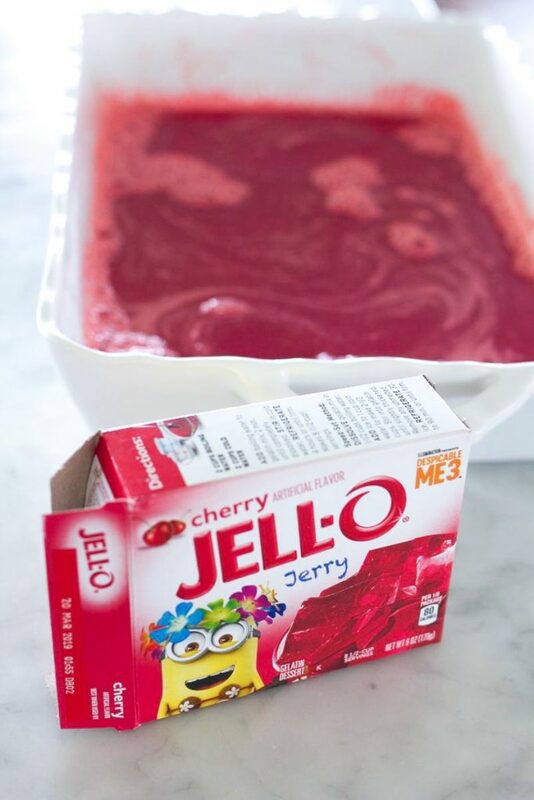 While water is heating up, pour the large box of Jello into a 9×13 pan. Pour the 2 cups of boiling water over the jello in the dish. Using a whisk, slowly mix the jello and water together until all of the Jello is dissolved. Make sure to scrape up all of the Jello off the bottom of the dish. 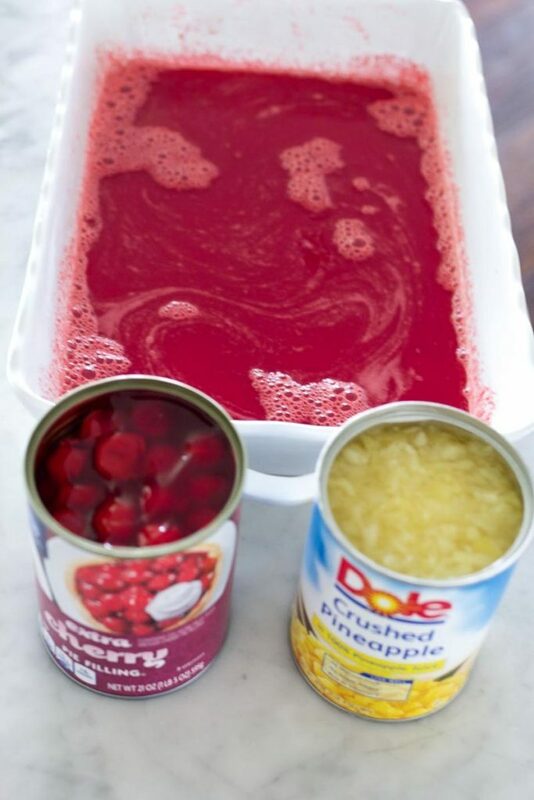 Pour the contents of the can of pineapple and the can of cherry pie filling into the pan with the Jello and water. Mix with large spoon. Place pan into refrigerator. Let set up for about 2 hours. It’s usually set after 1- 1 1/2 hours. 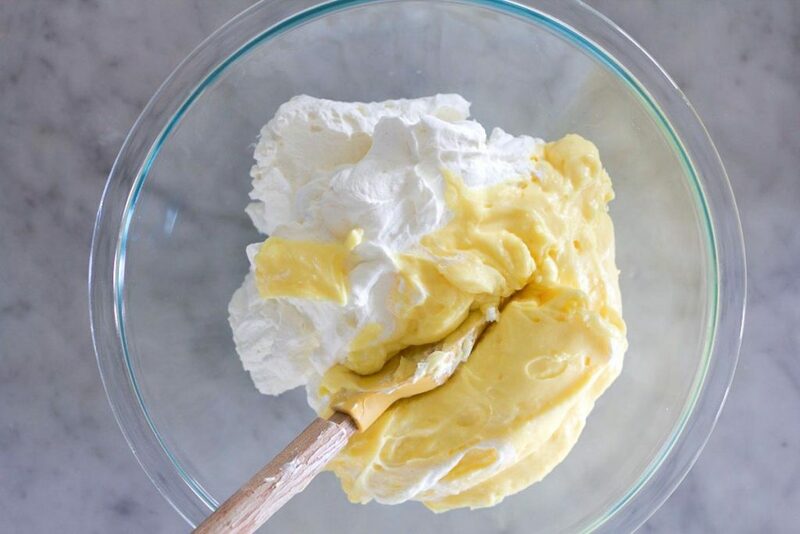 Whip the cream in a large bowl until stiff, set aside.In another bowl, whisk together 1 cup of milk and the box of pudding. Fold the pudding mixture into the whipped cream. Spread the whipped cream mixture over the set-up Jello mixture in the pan. Serve immediately, or return to fridge until ready to serve. You may sub any flavor of Jello. I’ve used anything from Strawberry to Cherry. Anything red works. I’ve never tried using sugarless Jello or sugarless pudding in this recipe. Leave a comment if you experiment. *The original recipe calls for Cool Whip. A medium size container works. I’m not a fan of Cool Whip. 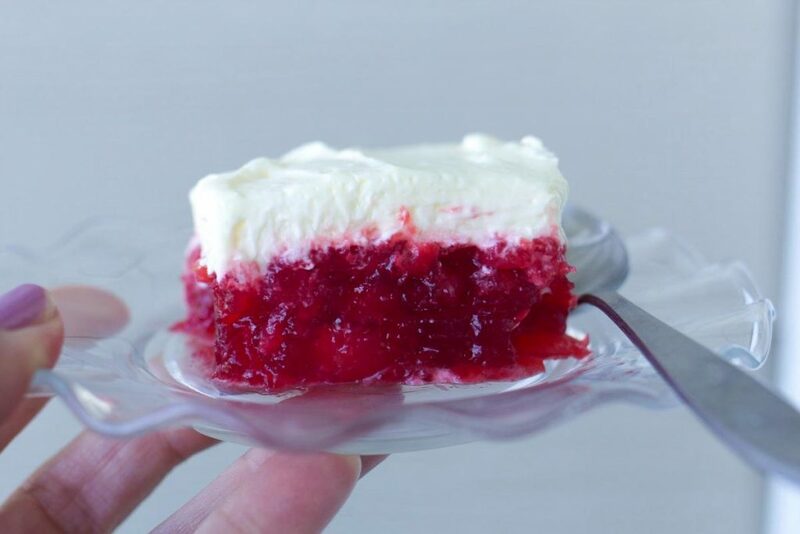 And since I’m not a huge Jello fan either, I use real whipped cream and it improves the dish in a big way. If after reading this you still want to use Cool Whip-mix the pudding in a bowl with 1 cup of milk. Then fold in the Cool Whip. OMG! What a delicious looking! I can't wait to eat this 🙂 Thanks a lot for sharing. My mother is the Jell-o queen, but I haven't seen this recipe in her collection. I'll pass it along. Thanks for posting! Being from Utah myself I love Jello. Now to get the rest of my family on board! my favorite part about this is that the original recipe author is named, "Claudeen:)" A perfectly utah mormon name to go with j-e-l-l-o! i was a tiny bit dismayed that it wasn't called a "jello SALAD," but i'll try to get over it! 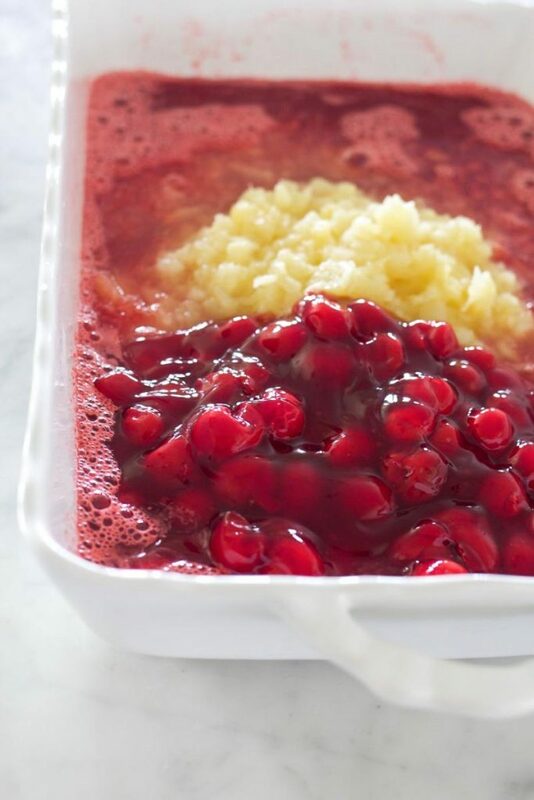 In Claudeen's perfect cherry jello, did you drain the pineapple? No need to drain the pineapple in this recipe! I use 1 sm. box regular & 1 sm. box sugar free in jello recipes all the time & no one ever knows. Always tastes great! Could this pie also fill a pre-baked pie shell? Or would it cause the crust to become too soggy? That is a great question…I really can’t say. I do know the filling sets up fairly quickly. Maybe it would be best to let it set up for a few minutes (30?) in a bowl, then scrape into the pie shell. Or, you could also fold some of the pudding and whipped cream mixture into the jello layer and then place in pie shell. Then just top with the rest of the pudding/whipped cream mixture. Let me know if you give this a try! The Best Cherry Jello recipe is right above the comment section. Just scroll down. I added the link right here so click on the name and you’ll find it! Perfect for Easter. Yes! 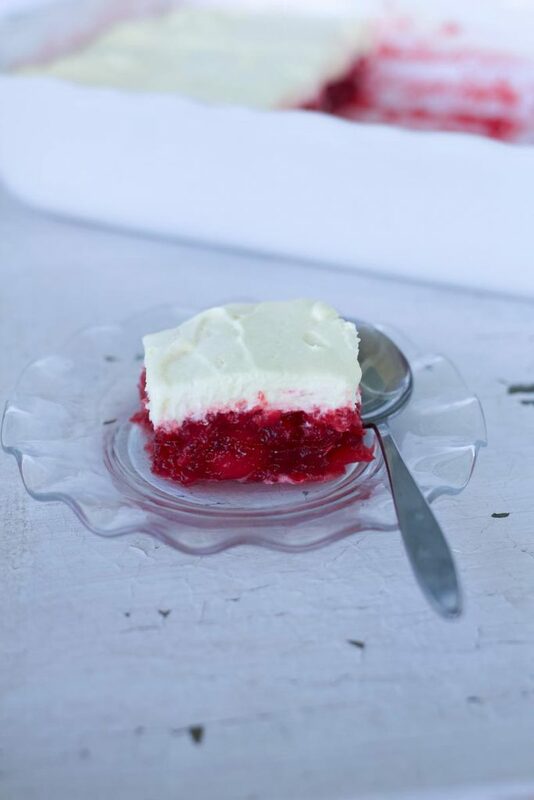 Make the Jello ahead of time but wait till you are about to serve to top with the whipped cream mixture. I used sugarfree jello and pudding, real whipping cream and whole milk in pudding. Turned out beautifully! Husband is type 2 diabetic so I try to cut carbs where I can. I’m glad this recipe worked well for your family. Thanks for your tips on adjusting this recipe for diabetics! Thank you for reading ABK. This is so good! I just made it on Sunday and my husband asked me to make it again for the 4th. Thank you! Thank you, Stacey! We love this recipe too and it’s perfect for any holiday. I’m glad you love this dish! It’s a family favorite. I’m sorry I don’t have the nutritional information , you should be able to enter the info on a site that provides this info.